Buying A Used Violin? Here's What You Need To Know. Over the years, I've had students buy violins from friends, craigslist, garage sales, ebay, pawn shops, and just about anywhere else you could think to buy a violin. I've seen some great quality violins at a STEAL of a price, but I've also seen some falling-apart violins that would have ended up costing more in maintenance then the violin was worth in the first place. If you know what to look for, a used violin can be a great purchase. Because the cost of monthly rental payments on a violin will add up fast, buying an inexpensive used violin is usually a much better financial decision. The only problem is — if you're not buying your violin from a store with a trained violin luthier on staff, it may not be in great condition. 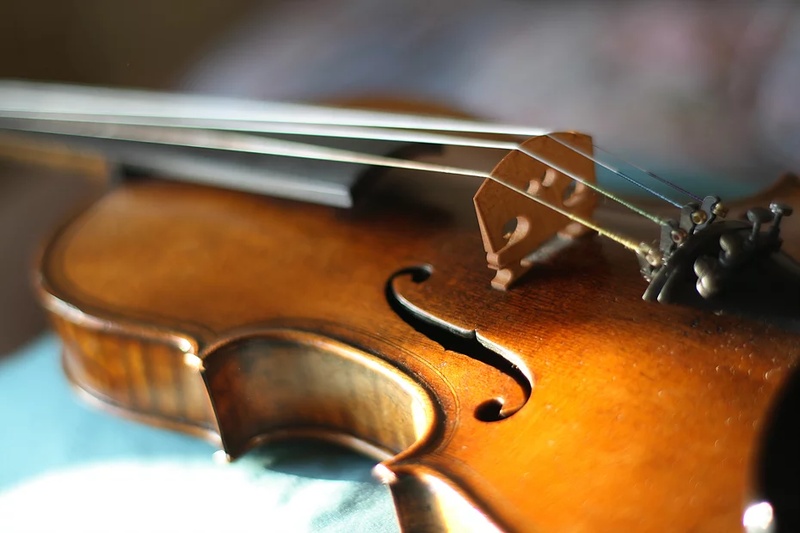 Violin strings are supposed to be replaced every 6 months to a year, so if you're buying a violin that's been sitting in someone's attic, don't expect the strings to be in good condition. Buying new strings is something you would need to do with any violin! The bridge is located underneath the strings in the center of the violin. The bridge is not supposed to be attached to the violin. It's actually held in place by the tension of the strings. So if the strings are completely loose, the bridge may fall over. (That's normal!) If that has happened, have your teacher or an experienced violin player tighten the strings to their normal tension level. Then look at the feet of the bridge. Are they rested firmly on the violin, or do there seem to be cracks in between the feet of the bridge and the violin? If the curve of the bridge feet doesn't match the curve of the violin perfectly, the bridge is more likely to slip or fall over. The pegs are located on the scroll of the violin and are used to "tune" (aka tighten or loosen) the strings. The pegs on a violin that hasn't been played in a while might be hard to tighten or loosen. Once the violin is regularly played and tuned, they often "settle in" and start to stick much better. If they don't start to work better after a few weeks, you might want to consider taking it to a professional, but normally this isn't a huge issue. The bow hairs should tighten and loosen easily using the metal screw near the end of the bow. When the bow hairs are loose, the bow should have a slight arch. If it's straight or arched the wrong way (like a bow and arrow), you will probably need to buy a new bow. But as long as the bow has an arch and you're able to tighten the bow hairs to leave a pencil-width gap in the center of the bow, you should be good to go! I hope this helps you know what to look for when you're checking out used violins! If you're considering taking violin lessons from NOLA School of Music, feel free to schedule your first lesson with me and I'll show you in person exactly what to look for! We normally recommend coming in for your first lesson before you purchase an instrument so we can help you know what to look for, where to shop, and what books and accessories you'll need.